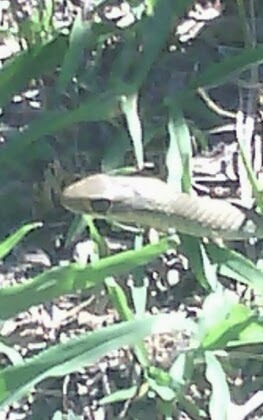 This is Esmerelda, the Yellow faced whip snake that calls our yard home. The yellow faced whip snake is a very common visitor to yards in our area, we see the two that live in our yard regularly. This particular snake (Esmerelda) is fond of following me around as I feed the chickens (if I feed late) and I have had to chase her off when I feed the sheep so she doesn’t get trodden on. Whip snakes are friendly and curious creatures, they like to know all the gossip and will come very close to you if you sit still for a long time (although, as most sources say they are timid snakes, that might just be the ones that live here). They eat small reptiles like skinks and frogs, are diurnal (not night owls) and home bodies; staying within the same area all their life. They have been known to lay eggs communally and may even exhibit pairing behavior. 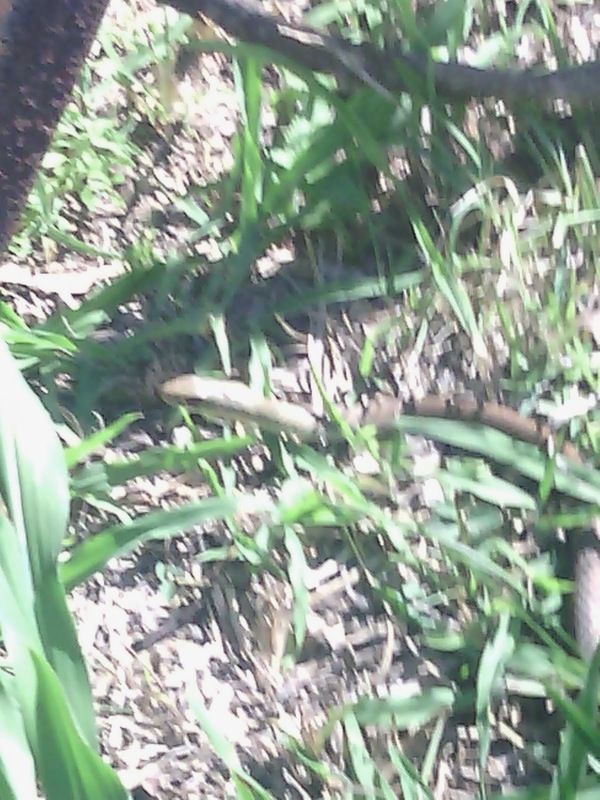 They would rather get away from you than bite and there has never been a fatality from a whip snake bite. People in our area often kill them thinking they are Eastern brown snakes (they do look a bit like baby browns), but their behavior is very different and the extra large eyes give them away if you stop to look closely. Whip snakes are mildly venomous; having the same kind of venom as bees. If you are allergic to bees, don’t get bitten by a whip snake. They are not aggressive at all if you don’t try to pick them up (they hate that), but they will crawl (slide?) over your legs in a friendly manner if you are sitting on the ground near them. Mostly encountered at dawn and dusk, unless you disturb their resting place. Behave aggressively as soon as they see you; rising to striking position, swaying and coiling body together. Flick their tongue rapidly and often. 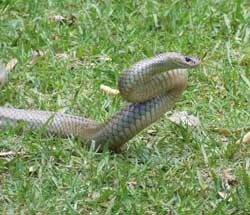 An Eastern brown snake in an aggressive pose ready to strike. Mostly encountered from mid morning to mid afternoon. Behave curiously; rising up above grass to watch but not in a striking position (see photos). Will follow people or animals but usually puts out a ‘just passing through’ vibe. Do not often flick their tongue, instead remaining still and quiet. 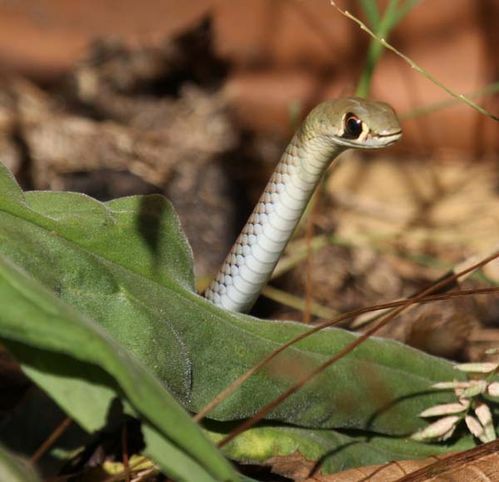 A curious whip snake checking out the area. Esmerelda watching me to see if the camera is dangerous. Deciding that the camera is not dangerous she shows me her good side and goes about her day. 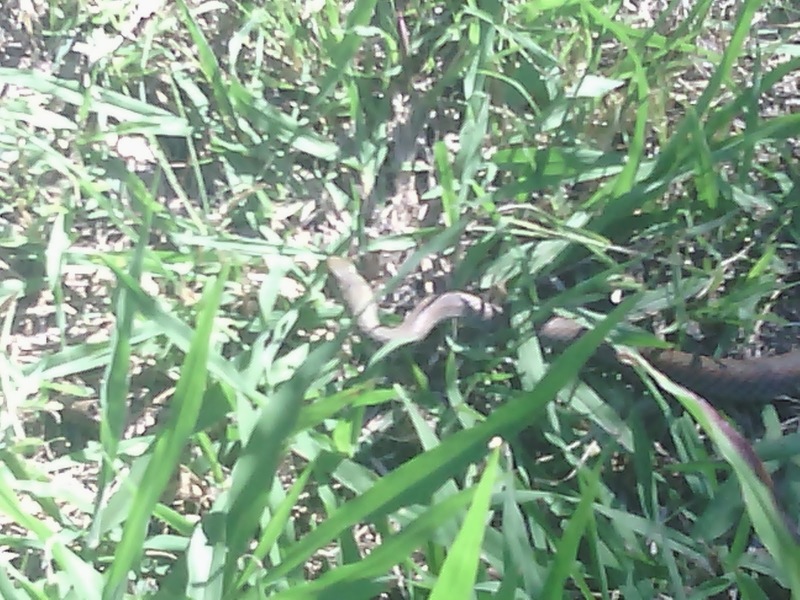 Do you have any interesting snakes in your yard?